Every child is born innocent, creative and curious. And that is a beautiful combination, which if nurtured well can result in masterpieces that wow the world for generations. Considering that parenting theories and practices are all controversial and different people follow different solutions, the one thing that all experts agree on is the importance of art in a child’s life. Apparently, trying out various forms of artwork helps stimulate children’s minds and helps them to think in unconventional ways. Not to mention it develops their gross motor skills – holding a crayon, applying glue, sticking on pictures or doing more complex craft projects. And there is of course, the sense of achievement when a child sees his completed project, no matter how messy it is. There are also fringe benefits of bonding when done in a group and a mode of expressing their feelings. In today’s world, arts and crafts also translate into a hobby which is a great way for adolescents to spend their free time rather than engage in mindless activities. Several centers for troubled children also use art and crafts as a medium for change. Now that you’re convinced that arts and crafts play a significant role in your kid’s life, you obviously want to set up a craft friendly environment at home. Also, it’s now summer, and we know how summers in India can get – tortuous!!! Going out is quite a task, and so most kids prefer to spend their time indoors – perfect crafting time!! 4. Packing material – should be really careful here, also beware of the mess! 10. Twigs, leaves, little rocks – nature is a great storehouse as well! 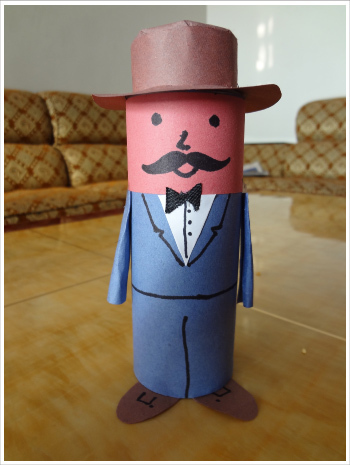 How’s this for a crafting advantage – you teach kids the importance of recycling!! It goes without saying that you should put your child’s safety first as well as consider the age appropriateness of the craft project. That’s another plus with crafting – it is a lot of fun to go shopping for supplies, researching projects on the internet and then actually getting down to the nitty-gritty. So much better (and cheaper) than spending money on battery operated plastic junk!! There’s also the question of mess, especially with younger kids. First of all, ensure adequate storage. Ideal solutions are see-through plastic bins with lids as well as transparent hanging shoe organizers. Then just spread loads of newspaper before they start, and put on a large size craft apron. That way, you can all have some stress free fun. Who knows, maybe even Mommy and Daddy will get really carried away with crafting!! So here’s to a curious and creative summer! Fabida Abdulla is a former software engineer turned stay at home Mother Lion to her four-year old son, whom she calls ‘The Cub’. She blogs about her crazy life at Shocks and Shoes.